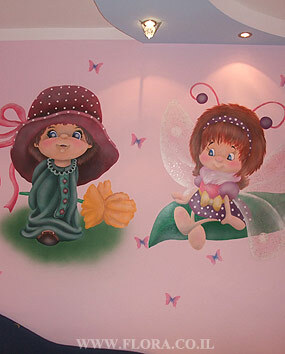 FLORA - MURALS - KIDS ROOMS - FAIRIES ROOMS - GIRL WITH FLOWER AND BUTTERFLY FAIRY – BABY ROOM MURALS. Girl with flower and butterfly fairy – baby room murals. Muralist: Flora. Location: Ashdod.